Reaching out to patients to ask them about their experience and outcomes is a great opportunity to ask them if they would like to be more engaged with their local healthcare providers. Many of our clients use this to collect details of patients who would like to be involved. It has the added benefit of being able to target involvement at particular services or from particular patient groups. You can use the process to drive focus groups and get up to date panels of patients from particular groups or who have recent experience of using certain services with little effort. 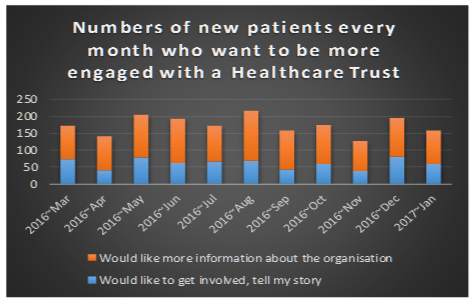 Shown here are the numbers of patients every month who are asking to be involved and receive more information from one of our clients.